An important movement has been set in motion in the UJC 2: Marxist-Leninist militants have formed établissement groups and are going among the popular masses, to live in their midst and to work in production. The principal task we are currently faced with is developing and strengthening this movement, unifying its orientation, its style of work, its organization. To do this, we need above all to correctly grasp the political tasks of this movement, tasks stemming from the concrete reality of the class struggle in France. Students and Marxist-Leninist militants who are not workers have entered the factories in an organized way. What are they going to do there? What are the limits of their work? In what way does this constitute a step necessary for the development of the Marxist-Leninist movement in France, for the building of the Communist Party? Such are the questions we must answer. The answer to these questions can be summarized in a single sentence: the political objective of the établissement groups is to create among the workers themselves the leading nuclei of revolutionary Marxist-Leninist struggles, the leading nucleus of the Marxist-Leninist movement. In other words, the établissement groups movement is a concrete answer we are offering today in France to the universal problem posed, here as elsewhere, by the birth of a political vanguard of the proletariat: the problem of the fusion of revolutionary Marxism and the workers’ movement. The most advanced revolutionary ideas and theories first take hold, on a large scale, among students and young intellectuals. This is a law of historical development that is being verified in France like everywhere else. But the students and young intellectuals cannot be the leading force of the revolution, even when some of them link up with the masses and transform their own point of view. Only the working class is powerful and vigorous enough to take the fate of the revolution into its hands. It is incumbent therefore upon young revolutionary intellectuals to play the role of intermediaries, in order to make these vanguard ideas take hold among the working class, especially among the most combative elements of the proletariat, who must constitute the driving force of the revolution. We will see later on why it is currently necessary, in order to carry out this task, that young intellectuals enter into production. What are, in France at the present moment, these advanced revolutionary ideas that first took hold more or less widely among students and young intellectuals? In short, the thought of Mao Zedong, which has been spread once again, and been understood in a much more profound way, by the Great Proletarian Cultural Revolution. If the proletarian vanguard assimilates this ideology and this practice, if it unites itself still more closely than it could spontaneously with the working masses and the people, if it masters the essence of the revolutionary strategy and tactics of the proletariat, then the revolution will witness a new vigor in France. But what do we understand by “proletarian vanguard”? How is it that there is still what we might call a “divorce” between the vanguard of the workers’ movement on the one hand, and the vanguard ideas of the proletariat (the thought of Mao) on the other? And, above all, how to bring about a fusion of the two? In the French working class, advanced elements exist. These are the workers who, by their solid class position, the correctness of their tactics in the struggles against their employers, and by their spontaneous application of the mass line have gained the confidence of their comrades at work and have come forward as the leading elements of the mass movements in the factory. These workers are the cadre that the masses have given themselves, and they make up the de facto vanguard of the workers’ movement; in strikes, demonstrations, in all worker struggles, their role is decisive. Conducting work at the heart of the masses in a given place without concentrating one’s efforts on the creation of a leading Marxist-Leninist worker nucleus is in reality to deny the leading role of the proletariat in the revolution. Insofar as such a nucleus does not exist, no progress is possible in mass work. What are tasks for the établissement groups that stem from this general orientation? First, it is necessary that each établissement group rapidly put on its work agenda the training of a small nucleus of advanced workers won over to Marxism-Leninism, the spreading of the thought of Mao, the explanation of our political line, the study of our publications, the elaboration of Marxist-Leninist tactics in the workers’ movement. The goal of the établissement groups should be to quickly transform themselves into communist work groups in which workers play a leading role. As for the worker nuclei, it is best that they form small, clandestine union factions that will be able to apply a mass line in various firms and show workers through practice the correct path of the class struggle, all while progressively unmasking the revisionists. Our tactic is to form clandestine Marxist-Leninist nuclei among the advanced workers, those most active in the organization of struggles and union work. 1. 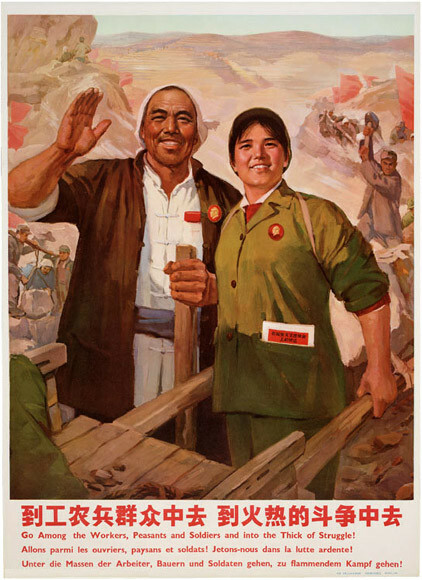 The left opportunist line, which would consist in our rushing (ourselves, once we have entered production, or with a handful of Marxist-Leninist workers) into open Marxist-Leninist propaganda within the working class; to engage in such an action before having accumulated sufficient forces, before having concretely demonstrated to the masses the correct line of work by systematizing its own ideas and its own aspirations, before having concretely unmasked the handful of leading revisionists, would doubtless be to cut ourselves off from the masses, to divide the union and to forbid ourselves all means of action in the struggle against management. 2. The “right” opportunist line, which would amount to carrying out by ourselves, without completely associating our work and tactics with a worker nucleus, even a very small one, a “snail’s pace mass line,” that is, in making limited elements of political consciousness slowly take hold, bit by bit, among the worker mass. How does what we have discussed affect organizational forms? It would mean that the “établissement groups” form (students and M-L militants going to establish themselves and entering production) is a provisional one: the établissement groups should transform themselves as quickly as possible (some months) into Communist Work Groups at the site of production, in which the workers won over to M-L, the union leaders and militants, the older experienced militants or the young workers active in struggles, the creation of a Union, etc, play a leading role. We should then have as our short-term goal the uniting of these worker nuclei into a single organization, the organization of Communist Work Groups, developing unified tactics in the workers’ movement and unified propaganda among the masses, effectively controlling the content of our publications, etc. 1. We must free comrades up from the ideological and organizational problems posed within the UJCml. It is not good for these comrades to divert important forces towards carrying out a direct ideological struggle (meetings, debates, etc.) within the organization. 2. Organize the meetings of the établissement groups in a proletarian style: brief and concrete discussions, carefully planned and leading to practical measures and texts. The propaganda within the UJCml in favor of établissement should be pursued. But it is indispensable to put an end to the petit-bourgeois excess that marked the first period. We must resolutely liquidate ideological terrorism and sectarianism. d. to build, under the leadership of these advanced worker nuclei, a communist thought, which is the decisive instrument for general propaganda among the working class. The movement in favor of établissement should be founded on these political bases. It is indispensable that comrades who are going to “settle down” have assimilated these political bases and are equipped to make them actual. Studying our internal press and publications, discussion with workers, reflection on union questions, militancy and the work of propaganda in the youth movement and in neighborhoods can constitute, for these comrades, instruments of this preparation. 2. The petit-bourgeois line of ideological terrorism on the themes of self-revolutionization should be criticized, combated and defeated. We should explain that it is not up to some militants in our midst to “transform” and “revolutionize” their comrades through closed-door discussions, baptized “ideological struggle.” It is through political work, political education, and prolonged struggle at the heart of the masses that our comrades will be able to transform their point of view profoundly, learn to correctly serve the people, and to make revolution. With regard to the criticism of our class position, of our conception of the world, nothing can replace the oversight exercised by the masses themselves. For the time being, the weapon of militants in the ideological struggle within the organization is political discussion, backed up by facts, in the light of Marxism-Leninism and the thought of Mao. With regard to methods within the établissement movement, we should PUT POLITICS IN COMMAND, avoid squandered energy and haphazard efforts, and arrive at the greatest effectiveness possible in carrying out our tasks. 1. ↑ The original title for this text appears to have been “On the Établissement Groups.” In his Le Mouvement “Maoïste” en France: Textes et Documents, Patrick Kessel offers this explanation for the origin of the following text: “On the établissement groups [October 1967], extract from a dossier put together by the Central Commission of the Établissement Groups and meant for these groups, distributed in June 1968, mimeograph.” Image thanks to chineseposters.net. 2. ↑ Union des Jeunesses Communistes: “Union of Young Communists.” On the formation and history of the UJCml, see my “From Établissement to Lip: On the Turns Taken by French Maoism” in this issue of Viewpoint. UJCml was a French Maoist organization founded in 1966.